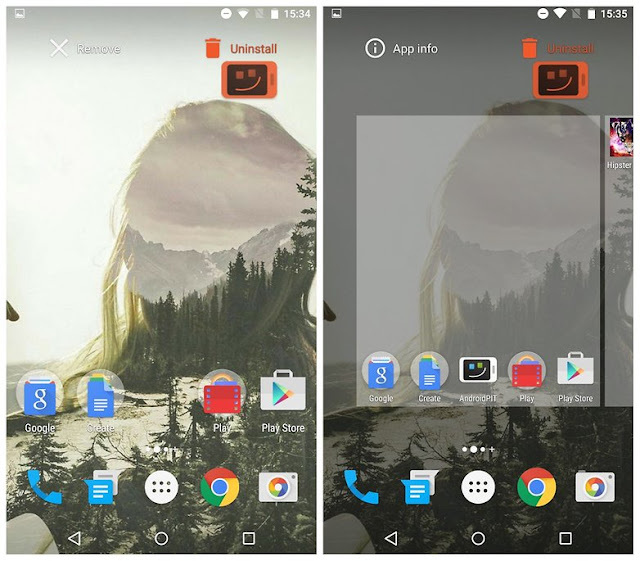 In Android Marshmallow you can now uninstall an app on your home screen or in your app drawer simply by long-pressing it. At the top of the screen you’ll now see options for Remove or Uninstall on the home screen, or App Info and Uninstall in the app drawer. Simply drag the app icon to the one you want. 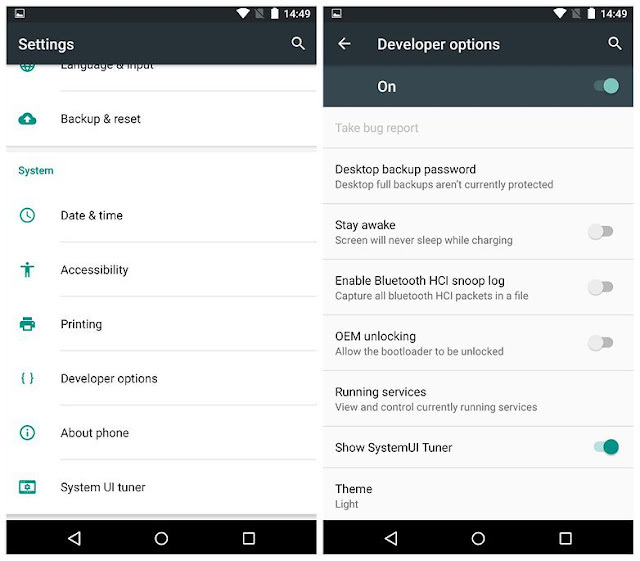 Developer Options are nothing new, but there are a few new developer one in Android Marshmallow. To access Developer options, go to Settings > About Phone and tap Build Number seven times, until a toast pop-up notifies you that you are now a developer. Back up a step and you’ll see Developer Options listed right above About Phone. This is where you can enable USB Debugging, OEM Unlocking or Show Touches, tweak animations, or access some of the other tips below. Granular app permissions was the holy grail of the Android Marshmallow release. We all hoped it would pan out but no one really believed it would. We had always been told that denying specific app permissions within a third-party app could break it. 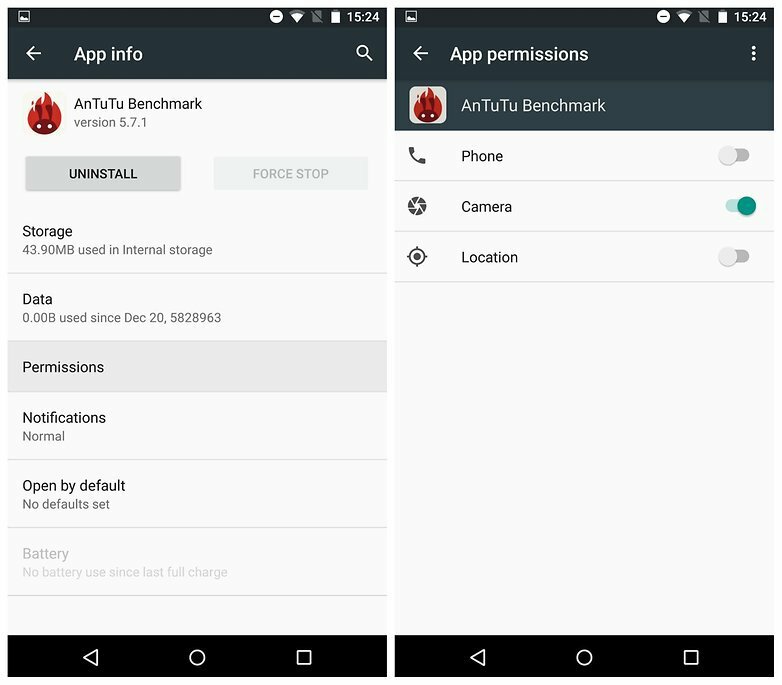 Now, however, Android lets you manage app permissions individually, without developers having had to do anything, and everything seems to work swimmingly. 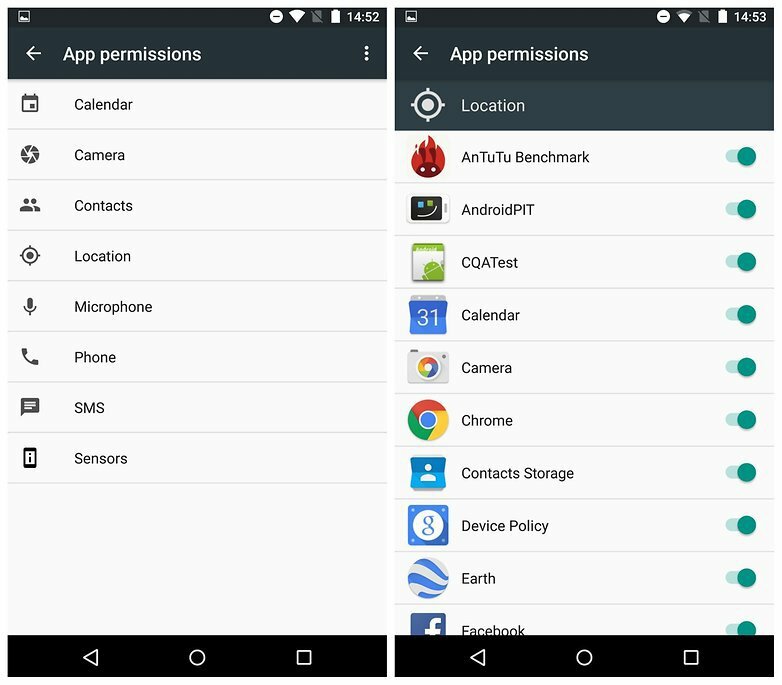 To access app permissions, go to Settings > Apps and tap an individual app to see its permissions. Then simply flip the switch for the permissions you do or don’t want to grant it. You can also view a list of permissions to see which have been granted to which apps. Just go to Settings > Apps, then tap the overflow menu in the top right corner and go to Advanced > App Permissions. The UI Tuner is available once you’ve enabled the Developer Options mentioned above. Just go to Settings > Developer Options and flip the switch for Show System UI Tuner. 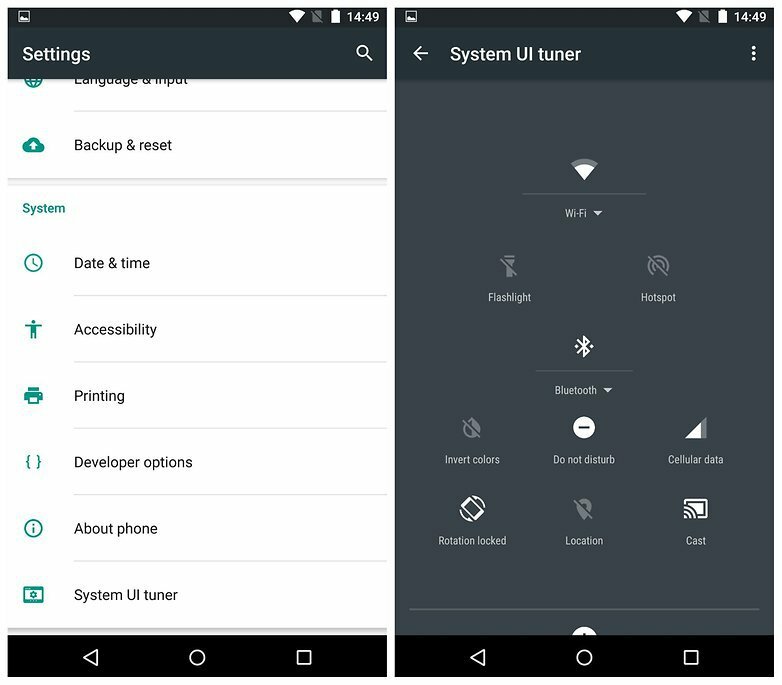 Back up a step and you’ll see System UI Tuner at the bottom of your Settings list. In System UI Tuner, tap Quick Settings and you’ll see a mockup of your Quick Settings shade. You can add tiles (press the + at the bottom), move the toggles around (tap and drag) or delete toggles (tap and drag to the bottom). Your changes will be reflected in the Quick Settings menu. 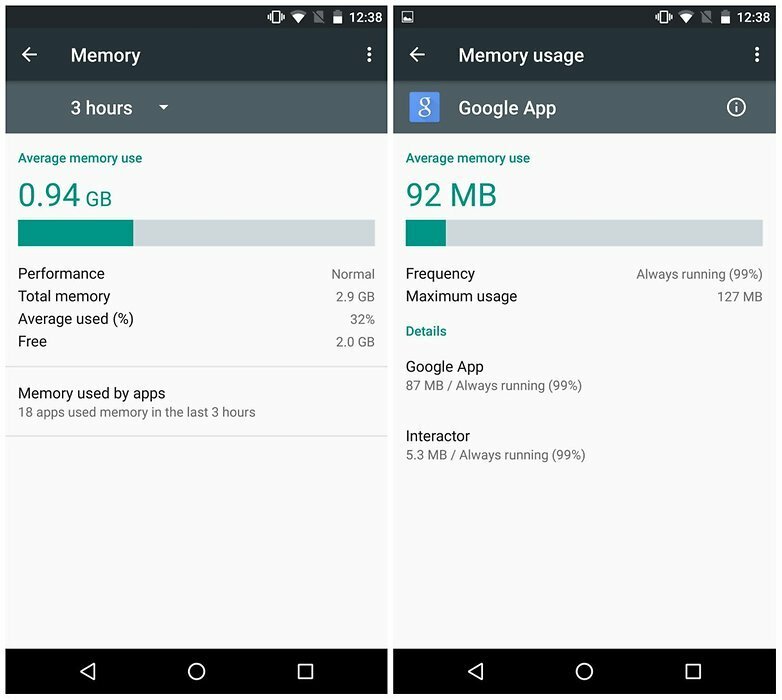 Android Marshmallow is all about giving us even more power over our beloved Androids, and RAM is a huge part of that. Go to Settings > Memory > Memory used by apps, to see a list of all your memory-hogging apps. Tapping an entry will show you detailed info and give you the option to force stop the app if necessary. Take some time to familiarize yourself with this part of your Android – it’s a great tool to help you understand what RAM usage is normal and what’s out of the ordinary. The RAM Manager is also effectively the new home for the ‘Running’ tab that was in previous versions of the Settings > Apps section. Unlike previous Android versions, Android Marshmallow doesn’t break your apps list down into tabs for ‘Downloaded’, ‘Running’, ‘All’ and ‘Disabled’. 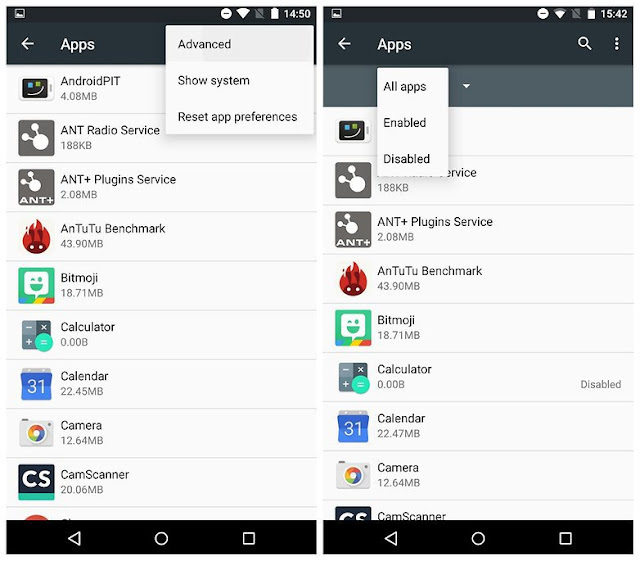 The ‘Running’ tab now appears as RAM Manager; ‘All’ and ‘Disabled’ are now options in a drop-down menu, accessible once you’ve disabled at least one app. The default view in Settings > Apps is the ‘All’ apps tab. We’ll have to wait and see how devices with SD cards display the information that was previously found in the ‘SD Card’ tab. Android Marshmallow allows you to automatically associate specific apps with specific types of links. So if someone emails you a Twitter link, for example, you can set Twitter as the default app for opening such links, rather than picking from a list every time. Although you could set certain apps as default apps before, the system didn’t work all that well. 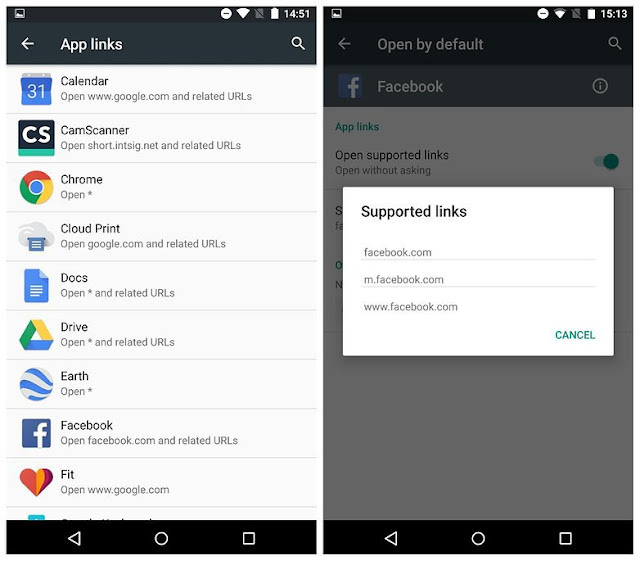 Now you can associate specific domain URLS with an app of your choice. For example, all facebook.com links can be set to open either in Facebook, Tinfoil or another third-party Facebook app automatically. To do this, go to Settings > Apps, then tap the overflow menu at the top right and go to Advanced > App Links, then flip the switch for the apps that you want to set to automatically intercept links from specific domains. Android Marshmallow delivers a great new feature called Doze. When your phone or tablet has been inactive for a while, Android Marshmallow will automatically hibernate it (although alarms and priority notifications can still come through). 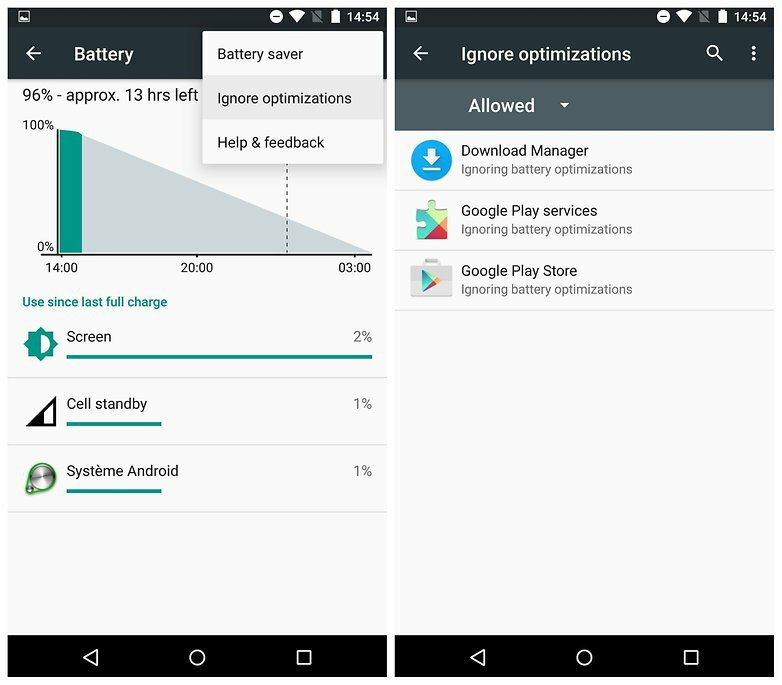 You can also still use the Battery Saving Mode, just like in Lollipop. Now, however, you can exclude up to three apps from the battery optimizations imposed by Battery Saver or Doze, so they can run at full strength while everything else takes a rest. Go to Settings > Battery and tap the overflow menu in the top right, choose Ignore Optimizations and select the apps you want this to apply to. You can access the same menu from Settings > Apps > overflow menu > Advanced > Ignore Optimizations. You might have missed this one, but the lock screen shortcut to the dialer has been replaced by Google Now. This is a welcome change; you can use Google Now to call someone just by speaking (along with plenty of other things), so you haven’t lost out on functionality by losing the dialer shortcut. Simply swipe from the bottom left-hand corner of the lock screen to get Google Now ready to receive your voice command. Google Now on Tap is easily my favorite feature in Android Marshmallow. It brings Google Now functionality to every part of your phone or tablet. There’s no need to switch apps or copy and paste phrases anymore – once it’s enabled, you can bring up Google Now on Tap from any app, simply by selecting text and long-pressing the Home button.